Gardeners have a saying about planting perennials: “The first year, they sleep; the second year, they creep; and the third year, they leap.” The best tip for successful planting is simple, “Right plant, right place.” If you want a perennial to survive and grow, the plant must tolerate year-round conditions in your zone including lowest and highest temperatures, the amount of rainfall it receives and appropriate amount of sunshine. For example, if you are in Zone 5 - any plant that is Zone 5, 4, 3, 2 and 1 will be a perennial in your area. Plants rated only for zone for 6 or higher hardiness should be considered as an annual. Specific areas of your yard may be hot spots and tolerate one zone higher. We hope you use the following information as a starting point, recognizing that growing practices vary from region to region. What works for one gardener does not always work for the next as there are countless variables that enter into the equation. For more detailed planting and plant specific information click here. When your plant arrives, remove from the shipping box immediately. 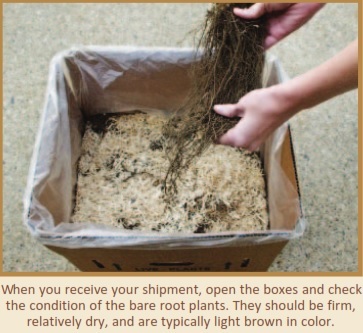 If any roots are frozen (some varieties are on occasion stored in coolers), allow to thaw slowly before handling. If it is a potted plant, immediately unpack, discard any packing material clinging to the leaves or soil. Cut any netting away, pulling the netting off may cause damage to foliage. Place them in an environment conducive to their needs and/or weather conditions and water thoroughly. If you cannot plant it within a few days, place the flat in a lightly shaded, protected area and water regularly. If it is a bare root plant (no soil around the roots and trimmed leaves), plant bare roots as soon as possible. Immediately unpack, discard any packing material. Light surface mold is not unusual. This is generally harmless and does not affect plant performance. A preventative fungicide is unnecessary unless the variety is prone to fungal diseases. Soaking the roots in water for at least 15 minutes is suggested. If you are unable to get your new plants in the ground quickly, unwrap the plants to determine if the roots are still moist. If the roots appear dry, soak them in tepid water for at least 15 minutes. Store in a cool, dry area. Do not let plants freeze. Be very careful to ensure there is no moisture on any leaves. Repeat every couple of days. until you are ready to plant it in the ground. If planting is delayed, heel them into a temporary bed. Dig a trench, lay the plants at a 45 degree angle, with roots in the trench, cover the roots with loose soil, and water well. When you are ready to plant it, do the job as early in the day as possible. Overcast, slightly cool weather is ideal, but you can always add some temporary shade if the sun is hot. Even sun-loving plants appreciate a little shade their first few days in the ground. Add organic matter at every opportunity! Adding amendments such as humus or compost at planting time is critical, but nutrients leave the soil over time, and need replenishment. Nearly all plants grow better in soil that retains moisture, drains well, and is fairly fertile. Continually work your soil and plants will grow to their fullest potential. If you are creating a new bed, till the area to a depth of about 10 inches, add a few inches of compost, and till again. If you are planting in an established bed, work compost into the top 6 to 8 inches of soil. A) Dig the hole. 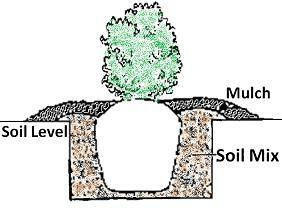 The hole should be dug at a depth so that 1/8 of the rootball will sit above the ground. Planting deep is a major cause of plant death. The hole should be twice as wide as the rootball. B) If bed has not been amended, a s oil mixture of 25% to 30% compost mixed with dirt removed from the hole is generally recommended. Do not use topsoil as a soil conditioner. Mix thoroughly. Carefully remove the plant from its plastic pot. If it is an Ellepot, the biodegradable paper sleeve is environmentally friendly and will decompose. Always handle the plant by its rootball. If root bound, loosen and spread roots. Make sure the plant is standing straight. Fill the hole with the soil mixture; by hand, pack down the soil. Do not put soil on top of the rootball. Mulch around the base of the plant. The mulch should be 2 to 3 inches deep. Be sure to pull the mulch away from the plant base to prevent disease and insect damage, especially in the South. Water the plant slowly and thoroughly. Prune any broken stems and branches. A) Dig shallow, wide planting hole. 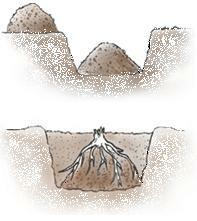 The hole should be almost twice as wide as the root system and about as deep as the roots are long. Planting deep is a major cause of plant death. B) If bed has not been amended, a soil mixture of 25% to 30% compost mixed with dirt removed from the hole is generally recommended. Do not use topsoil as a soil conditioner. Mix thoroughly. Set the plant so the crown (the part between roots and where stems will emerge) sits at or just below the soil line. Spread the roots so they cascade over the mound. Backfill with soil mix; by hand, pack down the soil. 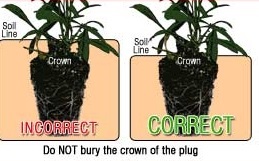 Make sure the plant is standing straight and the crown is just below ground level. Mulch around the base of the plant. The mulch should be 2 to 3 inches deep. Be sure to pull the mulch away from the plant to prevent disease and insect damage, especially in the South. Keep plants watered during their first season, even drought tolerant plants. A weekly deep soaking will encourage the root system. It is best to water early in the day, giving foliage a chance to dry out before evening hours - to reduce disease possibilities and crown rot. Apply a layer of compost each spring to provide nutrients and maintain soil health. Beyond that, most perennials need little supplemental fertilizer. Aquilegia, Amsonia, Asclepias tuberosa, Centaurea, Corydalis, Dwarf Iris, Echinacea, Gaura, Iberis, Lavandula, Lewisia, Lupines, Oenothera, Perovskia, Platycodon, Stachys, Verbascum, and Yucca. It is very important to water these varieties infrequently. 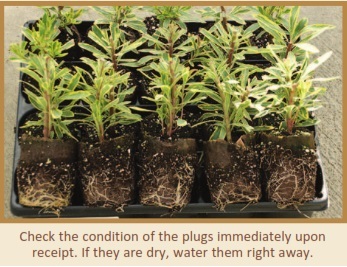 Plant the above varieties in a well-drained media, water in thoroughly after planting; water lightly thereafter. Iris ensata, Iris sibirica, Iris pseudacorus, Acorus, Cimicifuga, Astilbe, Dicentra, and Trollius. These plants are unforgiving if allowed to dry out. Leaves will scorch and regrowth will be slow. Deadheading- Pinching and pruning perennials will help keep them attractive and encourage rebloom. Not sure how many plants are needed? Click here for the Plant Calculator.